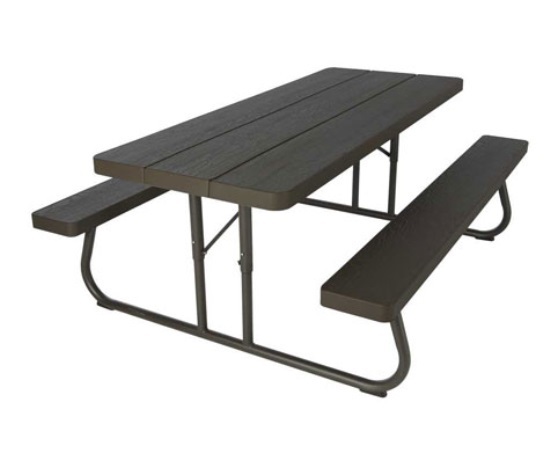 Get the great look of wood with the longevity of plastic with the 60105 folding Lifetime picnic table. 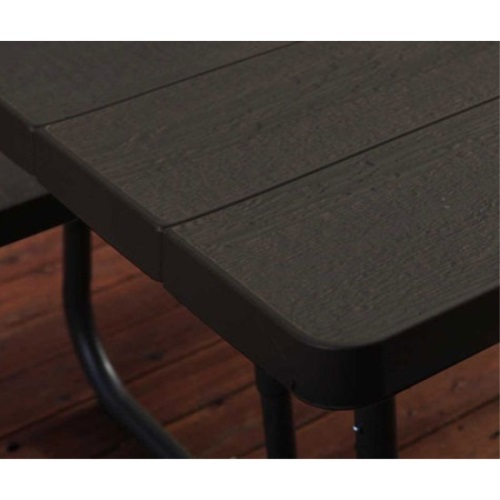 The table top is made with high-density polyethylene (HDPE) plastic, which resists fading, cracking, and peeling in the sunlight, unlike traditional plastics. The folding table frame is made with powder-coated steel, which provides ample strength and support for the table top and benches. Easily folds flat for transportation and storage. Order your Lifetime picnic tables here. 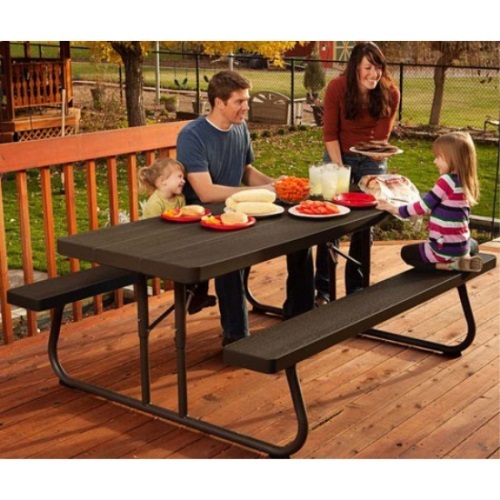 This plastic picnic table includes a 2-year factory warranty from Lifetime Products. Includes umbrella-ready hole with cover cap. Wood-grain impression provides the attractive look of wood. Height when table unfolded: 29 inches. Benches material of construction: HDPE plastic. Folding frame material of construction: powder-coated steel. Benches have a wood grain appearance. Bench dimensions when table unfolded: 72 inches L x 9 inches W x 19 inches H.
Table weight: about 76 lbs. Includes a 2-year factory warranty. Shipping dimensions and weight: 76.50 inches x 30.50 inches x 53 inches; 80 lbs. INSTRUCTIONS were horrible. While the table looks good, it doesn't have the stability of our old wooden table. Also has a small dent in the top of the table that I doubt will hurt anything. All in all, looks ok and grandkids will think it is great. We priced all-weather outdoor tables for our pool deck and were not excited about the prices...so expensive! Then we found this table and purchased it in dark brown. Our kids assembled the table within an hour and it's good quality, sturdy, and able to take a beating from the elements, as well as our 4 kids. Perfect! 5 star, easy to assemble, very nice looking, great price. Very easy company to deal with. Only problem is FedEx. 5 days late on their scheduled delivery. They sent it back to their centers TWICE to repair the barcode. Box looked like they drug it behind the truck, par for the course. I am fed up with fedex. Q: Is the table hard to keep clean? Does the fake wood grain have issues I guess is my real question or is it actually smooth? A: It does have a slight texture, because it is blow molded and has the wood grain look, but it is very easy to clean. Q: I see on your website that your store will price match. I found a place that has the item for a lower price. Would you be able to sell at the price found? Thank you. A: We will beat their price by $10, just give us a call at 866-308-5484, and we will give you the discount. Q: Is this the same picnic table 60228 I see at Sam's Club? A: Yes, it is the same with the exception of the color. Sam's Club carries the putty color which is gray in this table listing is brown. The brown seems to be the more popular of the two colors. Q: weight limit for benches ? 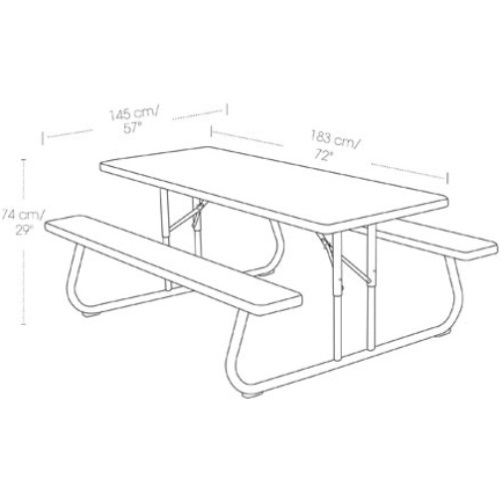 A: The manufacturer does not have a published weight limit for the benches. They simply advertise that it exceeds international furniture standards-meaning it really is heavy-duty-commercial quality. Q: can I buy just the hardware for this table? if so, what cost? A: Yes, that is available by calling 800-225-3865. Q: Who is the warranty through? A: The warranty is a factory warranty through the manufacturer, Lifetime Products. All warranty claims are filed through them. They can be reached at 1-800-225-3865. 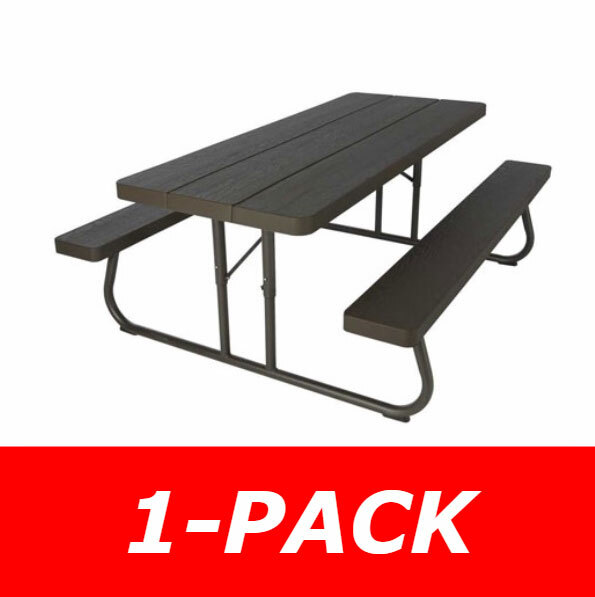 Here is an assembly video for Lifetime picnic tables. Fast Shipping: Orders for the Lifetime 60105 generally leave the warehouse within 1-2 business days. Delivery Details: This product ships directly from the warehouse in Kansas City, MO. This item generally ships via FedEx and may not require a signature. Local Pickup Option: This item may be available for local pickup in Kansas City, MO. If you are interested in picking it up locally contact our customer service for a super cheap pickup quote at 866-308-5484. Dimensions: 77" x 31" x 5"